The first time I almost died was March 23rd, 1959, the day I put on tefillin. I came of age in an old white house on Bustleton Avenue in Northeast Philadelphia, where boys were bar mitzvahed and girls were frowned upon. “My god,” said the rabbi,” with a look on his face as if the Red Sea had just closed back up. “You can’t put on tefillin that tight. You’ll cut off the blood supply to your brain.” It wouldn’t be the last time someone would tell me that. I was mortified. All the other boys looked at me with disdain. This is what happens, they thought, when you grow up on the gentile side of the Boulevard. My face was red, but my arm was as white as my yarmulke. Each Sunday, for the two months prior to our right of passage, we would meet in the back of the sanctuary, sitting on folding bridge chairs, at shaky aluminum tables, eating bagels that were rubbery and cream cheese that was watery, learning the faith of our fathers. It was the first time in my young life that I had eaten lox outside the home. In our house, lox was a delicacy, purchased only when company came, eaten only at times of celebration or sympathy. I knew full well that, if I could live through the rigors of tefillin club, we would soon be serving celebration lox, as I would become the first boy in my immediate family to become a man. I was worried and confused. Would the rabbi notice that I had gotten some Wildroot cream oil on the back of my box? Oy, how was I ever going to read from the torah if I couldn’t get some simple straps straight? For what seemed like an hour and a half, I sat in silence. My grandfather had given me these tefillin. They had been his. He was so proud to see me have them. He said a special blessing over the blue velvet bag before he handed it to me. My grandfather was an Orthodox man. 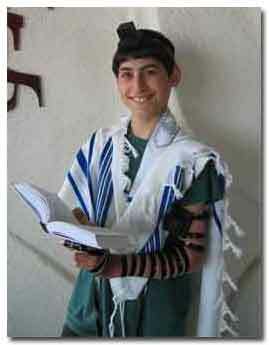 These tefillin meant the world to him. “Who is picking you up today?” the rabbi demanded. “My father is, rabbi,” I said with a whimper. “You tell your father I want to see him,” the rabbi said.” With that, he walked away. I was sick to my stomach. I couldn’t eat another bite of bagel. What if the rabbi made an example of me? What if he told my father that I couldn’t be bar mitzvahed because I couldn’t put on tefillin right? I looked at the big clock on the bema wall. My father would be here in less than ten minutes. I had to do something quickly. With the courage of the damned, I got up from my bridge chair and walked to the front of the shull. I had to find the rabbi. He had to give me a break. As I approached the bema, I smelled something strange. It smelled like my Aunt Anna when she was nervous. It smelled like smoke. And so it was. When I got to the back of the bema, there was the rabbi, dragging on a Lucky Strike. Quickly, my jaw dropped. You weren’t allowed to smoke in shull. ALL THAT I REMEMBER about entering heaven is that it was raining like hell. They let me ride up in the truck with the moving men. It was like those great cowboy movies I used to see all the time at the Jackson theater, which we lived next to, three stories up on top of the drugstore where we shared an apartment with a family of rats. Now we were the pioneers. The moving truck was our stagecoach, sloshing through the streets that weren’t paved yet into the wilderness of the new frontier of Northeast Philadelphia, a place where the homesteads were so big that you didn’t have to go to a park to see grass, you had it all around you, over nine thousand bucks worth of grass and bricks and status. That was a big deal back in 1949. For my parents, it was almost their life’s savings for the down payment after almost 20 years of stuffing dollar bills in the cookie jar. Now they were capitalists, blowing their whole wad. They followed the moving van up to the promised land in a Yellow Cab. “This will be good for the grass,” my father said, looking out through the thunder and rain like a new farmer surveying his first crop. My mother, who had never seen rain like this in South Philadelphia, was a little more sus­picious that this was a warning, the wrath of God telling us to stay off His turf. The pavements weren’t laid yet, so my father, knee deep in the big muddy, had to carry me on his shoulders all the way up to the door. I never saw him move so fast. The rains left us in a sea of madness for days. My mother was sure that our whole block was going to float down Robbins Avenue into the Delaware. When the sun finally came out, it took almost a week to dry things up. There was a new development just starting up across the Boulevard, my mother said. Maybe God had taken the rain there. It was at the end of this week of innocence and light that my mother called to me from downstairs to go look out the front bedroom window to see what the workmen were doing. I just could not understand what I was seeing, these two men with what looked like a big roll of carpet starting at the corner and laying this two-foot-wide strip of green next to the curb all the way down the block. It was the first time it hit me, fool that I was, thinking grass was something that grew in the ground. There, in the yellow haze of a land I did not understand, I saw two men in work clothes putting Mother Nature on the run, rolling out the green carpet up to the plastic gates of a mass-produced heaven. 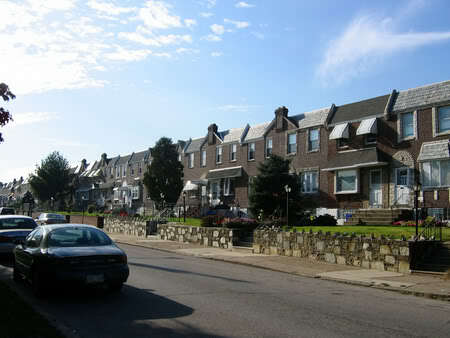 It wasn’t until a couple of years later that I realized this was what Northeast Philadelphia was all about.